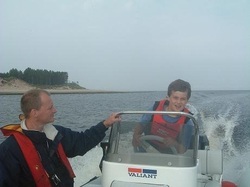 RYA's National Powerboat Scheme is for those wanting to drive small open powerboats such as RIBs (rigid inflatable boats), sports boats and small launches. These boats are generally powered by an outboard engine, do not normally have accommodation on board, and so are not intended for extended cruises. They may be used for short coastal or inland trips, fishing, safety cover for other watersports, waterskiing or as a support boat for diving. We offer the full range of RYA Powerboat training courses, please select from the options below. If you are unsure of which course you require please contact us and one of our instructors will discuss your options with you.